Where can I get a Bus/Transit Schedule? What is the cost to take the bus? What are the expanded hours for Brockville conventional and Para Transit? 6:45 a.m. to 6:15 p.m.
8:45 a.m. to 6:15 p.m. Please have your fare ready before entering the bus to minimize delays. Please note: Minor route changes, fares, sign placement and times may change. Brockville Transit is now offering a Student Semester Pass for students of all education levels. The cost is $150 / semester for unlimited rides during the current semester (valid from January 1, 2019 to June 30, 2019). 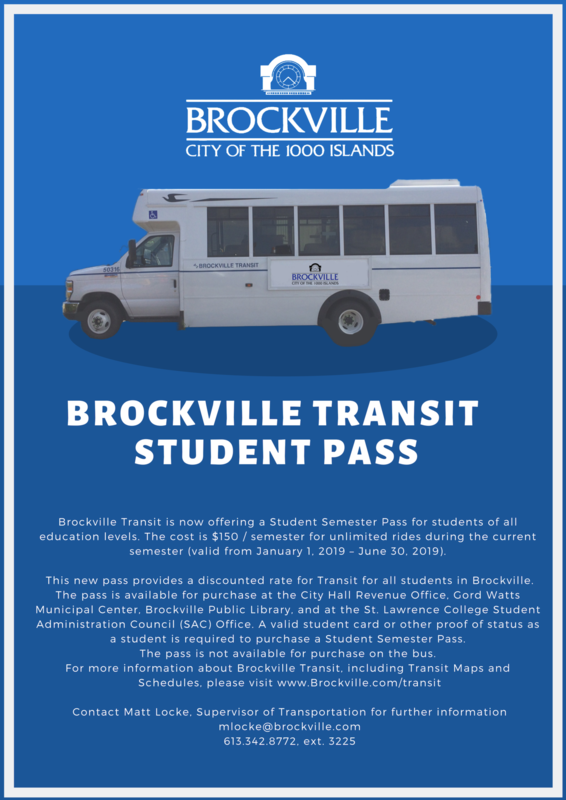 This new pass provides a discounted rate for Transit for all students in Brockville. The pass is available for purchase at the City Hall Revenue Office, Gord Watts Municipal Center, Brockville Public Library, and at the St. Lawrence College Student Administration Council (SAC) Office. A valid student card or other proof of status as a student is required to purchase a Student Semester Pass. The pass is not available for purchase on the bus.